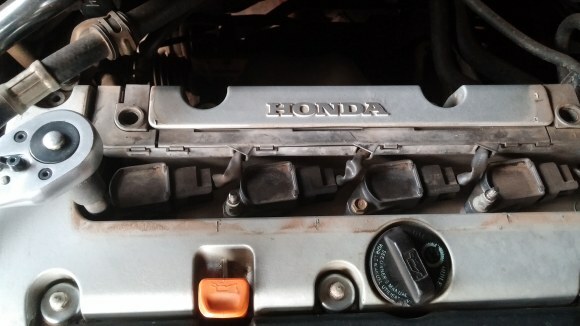 We consider how to replace the spark plugs on the 2003 – 2007 Accord 4cyl and why you should do this as recommended in the maintenance schedule. This should be done every 105,000 miles on the 2003 to 2007 Honda Accord 4 cylinder engine. Provides the spark to ignite the air-fuel mixture. Cooling: Dissipates heat from the combustion chamber to the engine’s cooling system. The ability of a spark plug to dissipate heat from the firing end to an engine’s cooling system is known as its heat range. Its always best to replace spark plugs at the recommended mileage. This ensures that the 2 above functions are performed at optimum levels. 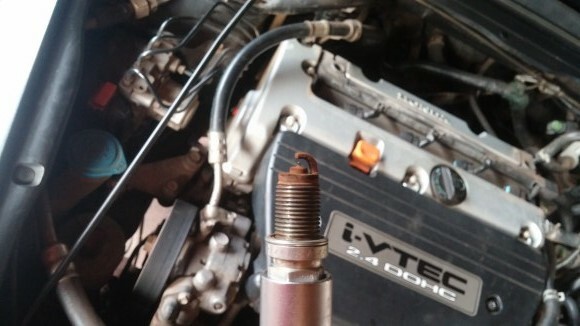 It’s not the best to allow your engine to start misfiring or hesitating due to worn spark plugs before you do a change. It results in poor gas mileage and could damage the engine. 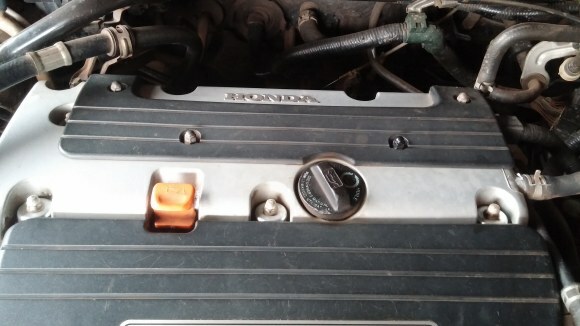 Equally important during spark plug changes is that you use the recommended spark plug for the vehicle, if not, you will have poor ignition of the air-fuel mix resulting in unburned fuel left in the combustion chamber. This finds its way to the catalytic converter where it will melt the substrate. Using the wrong spark plug also means having a plug with an out-of-spec heat range for the vehicle. This can result in under or overheating of the vehicle. 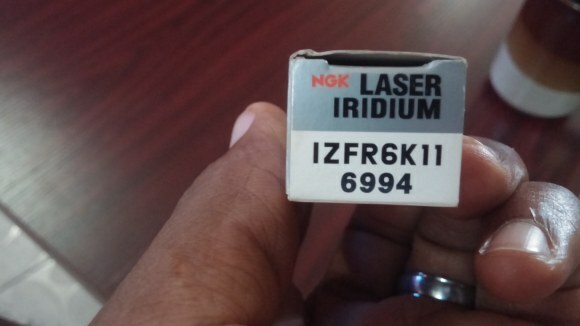 Materials: 10mm wrench, 16mm spark plug socket, ratchet extension (30cm if fine), and 4 of NGK IZFR6K-11 or Denso SKJ20DR-M11 (some will use NGK IZFR6K-13 or Denso SKJ20DR-M13). 1. 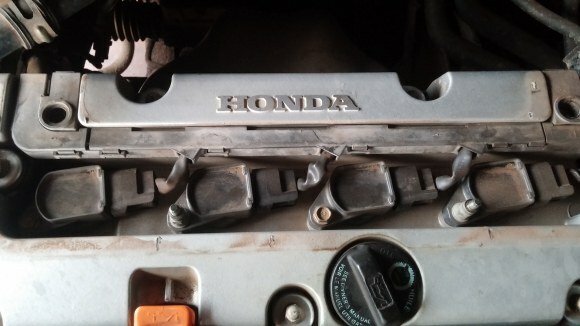 Remove the 4 bolts securing the ignition coil cover. To prevent dirt from entering the combustion chambers, blow off any dirt found in this recess. 3. Remove the ignition coils and note the respective cylinder each coil came from. You will return each coil to its respective cylinder. To remove a coil, pry it up. 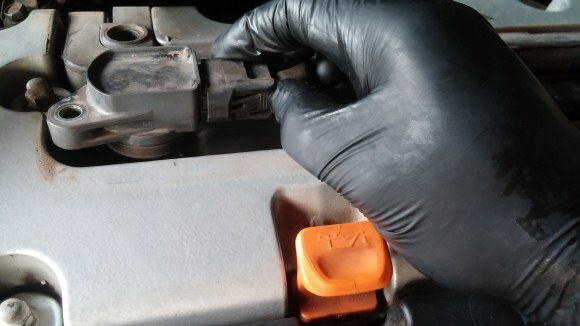 Once pried up, depress the tab on the electrical connector and detach the connector. If the connector is difficult to remove do not pull on the wire itself. You can use a flat screwdriver to gently pry off the connector while keeping the tab depressed. 4. 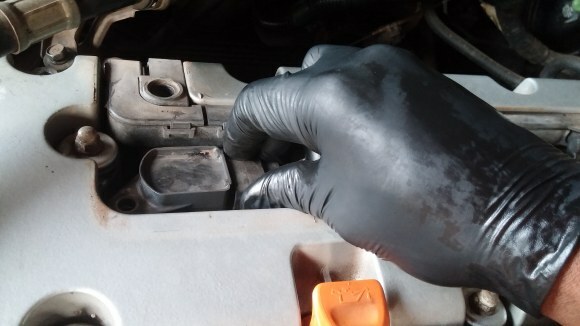 Remove the spark plugs using the spark plug socket and extension. Always inspect the condition of the old spark plug. It can tell a lot on the health of the car. A brownish to tan colouration of the firing end is normal. 5. Install the new spark plugs and follow reverse steps. First tighten plugs by hand until contact is made with the cylinder head then torque to 18Nm. If you don’t own a torque wrench, tighten 2/3rds of a turn after hand tightening has made contact with the head. Remember to use the correct plug for this vehicle as shown. You’re welcome Frank. Happy you found it useful. Buying a new car battery: Manufacture date?